Back in August I took my middle child on a quick trip to Atlanta where we enjoyed a few days exploring a new city. I’ve been through Hartsfield-Jackson airport a few times, but always connecting somewhere else with Delta. So it totally makes sense that the first time I decide to head to Atlanta, we’re flying United. But the deal was worth it. Delta, one of the world’s largest airlines, has a museum dedicated to its history just a stone’s throw from their primary hub. The Delta Flight Museum is located alongside the Delta corporate campus, just to the north of the busiest passenger airport in the world. The museum is housed in some of the original Delta hangars at Atlanta. The entrance fee is $15 for adults and $10 for kids. There are special rates for Delta employees and retirees, as well as members of the military. On days where the 747 Experience isn’t open but the museum is, entry is half price. 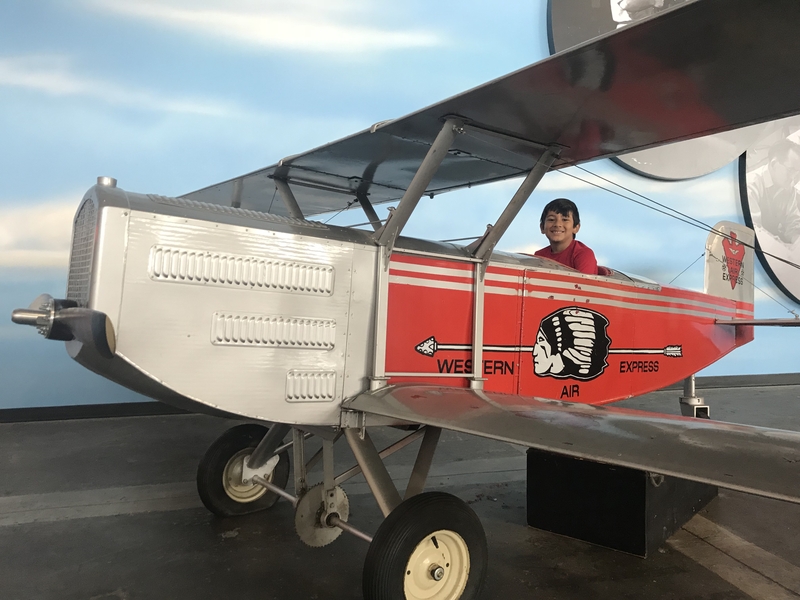 Unlike other air museums, the Delta Flight Museum focuses almost entirely on commercial aviation rather than a mix of military and private aircraft. This is a markedly different focus than what we saw when we visited the Pima Air and Space Museum in Arizona this past spring. The only modern commercial aircraft on display in Tucson are an ANA Boeing 787 and a China Southern Boeing 737, a tiny fraction of what that Museum offers. They also have a Super Constellation. I honestly cannot recall another commercial aircraft besides those. The Delta Flight Museum is different. It’s entirely about commercial aviation, even if it is from the perspective of a single airline. There is plenty to learn and see about commercial aviation through the years. Even if it means encountering some interesting specimens like these. My understanding is that these are flight attendant uniforms? But I’m really not sure about the one on the right. Can you imagine this today?? Let’s stick with the new plum uniforms. They are both classy and they stand out. The ones above just accomplish one of those things. I’ll let you decide which. Later I thought I’d try my hand at the safety briefing. Didn’t go so well. The kid I was trying to brief insisted on standing the whole time and taking my photo. Even though the details of how Delta came to be may have flown over his head, my son was having a blast as well. I’m not a pilot, but I got to explain what I know about roll, pitch and yaw to him as he worked the controls for this model. You might think the museum is one giant advertisement for Delta, and I can certainly see how that could be a takeaway. Sure, it’s self-serving, but the exhibits, commercial airline focus, and history kept me extremely interested. The Delta Flight Museum lets you trace the history of one of the worlds largest airlines from its humble roots as a crop dusting company to the global success it is today. The first route served was actually not out of Atlanta, but out of Dallas. Delta Air Lines started in the late 1920s hopping from Dallas, Texas to Jackson, Mississippi via Shreveport and Monroe, Louisiana. Tickets in the early days were extremely expensive. But this made sense, given the fact that flights were made in aircraft that could carry a mere 5 passengers. What fun ti must have been to fly in one of these. Innovation in aircraft construction and the airline industry resulted in vastly increased capacity within just a couple decades. Delta moved on from flying the tiny 5-seater Travel Air S-6000-B to much better aircraft such as this DC-3. But even the DC-3 is small in comparison to the Super Constellations and DC-10s the airline flew just a couple decades later. It was an amazing time of aeronautical innovation. It is also cool to see the evolution of the products and services offered inside the Delta aircraft through the years. Take a look at first class then versus business class now. Definitely glad I’m alive now rather than 40 years ago. When you arrive at the end of the era of piston-driven commercial aircraft in the museum, you move from Hangar 1 to Hangar 2. The focus then turns to our modern era of jet travel, and also of airline deregulation. Delta entered the period following deregulation weakly. Following this paradigm shift in commercial aviation, many airlines went bankrupt. But Delta managed to hold on. Hangar 2 is dominated by “The Spirit of Delta”, the first Boeing 767 owned by the airline. Amazingly, the plane was purchased with help from Delta employees and retirees who understood that the aircraft would allow the airline to compete more effectively. The 767 was a major technological innovation at the time in terms of fuel efficiency. You can explore inside the Spirit of Delta, which features both first class and economy class seats from 20 years ago. My son and I both enjoyed sitting in both sections. I couldn’t help but notice how much more comfortable economy was than the seats of today. One thing that surprised me was the phone. I guess I must have known that these existed at some point, but I’d never seen one. It left me wondering how expensive a call from an airplane is. Although The Spirit of Delta is a great experience, there was still an even bigger aircraft featured. And it is one you cannot miss. We definitely saved the best for last. 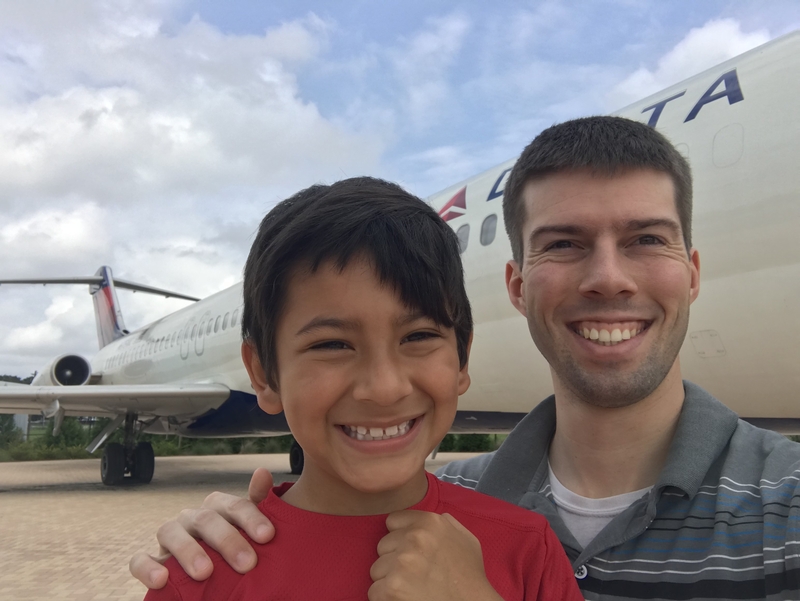 After exploring the two hangars that take you from Delta’s roots and early propeller planes into our modern jet era, we headed outside to the Delta Flight Museum 747 experience. The immense Boeing 747-400 is parked outside near the entrance to the Museum. Ship 6301, as the 747 is known, has been in place for a few years, but just opened last year as the Delta Flight Museum 747 Experience. A section of the movie shown onboard details how the plane was moved from the Atlanta airport across the road over to the museum. This Queen of the Skies will fly no more. She is an extra special one. Ship 6301 is the first 747-400 ever delivered to a commercial airline. She originally entered service for Northwest Airlines in 1989, making her just a matter of months older than I am. Delta acquired here during the Northwest merger. There are two permanent staircases built into the sides of the plane, as well as an elevator for those with disabilities. Once on the main level, you can explore most of the plane. There are some seats, but the bulk have been stripped out. There is a door in the side, allowing you to do a “wing walk”. Unfortunately, you cannot go very far out. 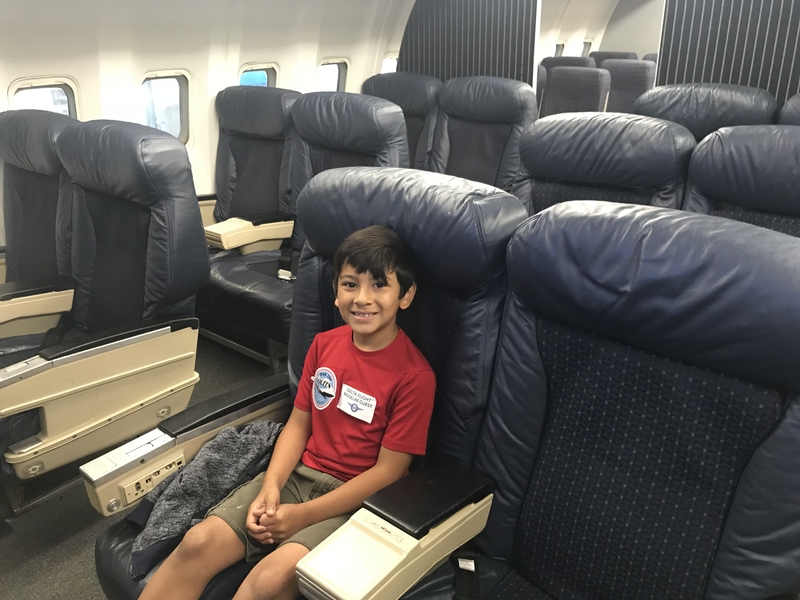 My son’s favorite part was exploring the upper deck that contains a section of Delta One seating, as well as the cockpit. The 747-400 does not have the iconic spiral staircase featured by the earliest 747s, but it is cool nonetheless. We also headed forward to the nose of the plane, where you can experience Delta One in both upright and lie flat mode. Normally you pay big bucks (or a boatload of miles) to get into this cabin. But not today. We could sit anywhere. So we did. Definitely a much better ride than our Delta 777 experience flying to Paris (SEE: Delta 777 Economy Review: Seattle to Paris). We headed back down to earth once we’d seen all there was of the Delta Flight Museum 747 experience. It’s truly amazing how massive these engines are. The Delta Flight Museum contains the only full Boeing 737 simulator open to the public in the entire country. It does cost extra. At not just a little extra. You need to shell out $425 for the simulator experience. While you can fit up to four people, I would assume only 1-2 would get to actively participate. The simulator experience includes 45-minutes of flight time after a 10-minute pre-flight briefing and is followed by 5 minutes of review. Some of the other…interesting…things we saw included a Delta cow. Yes, really. I didn’t really know what to say. I’m left wondering when and why this was made. As we were leaving, we also walked by a Delta Cooper. I hope the person driving is used to the wings sticking out on both sides. Our visit to the Delta Fight Museum was definitely one of the highlights of the whole trip. It is a testament to the history and global reach of Atlanta’s hometown airline and a thoroughly enjoyable experience. For someone who can’t get enough of the “jumbo jet”, the Delta Flight Museum 747 experience is unmissable. I don’t know of many other places where you can experience the Queen of the Skies quite like this. Definitely plan to come on a day where the Delta Flight Museum 747 experience is open (which is most). The Delta Cow is called the Flying Moo-dallion, Ian. I was also fortunate enough to have sat in the back of that black and orange Delta Air Service airplane. Did you get to do a behind-the-scenes tour? Or is it open sometimes? I read that at certain times you can get see inside the DC-3. Those AirPhones lasted a while. I used one once in about 1996. I was en route to Mexico and had to call my travel agent (!) because I’d forgotten what company the rental car was with. I believe at the time it was about $2-3/minute. LOL. That’s pretty steep. But probably worth it in a pinch. Went last month, amazing experience for people who are aviation geeks. For those who haven’t heard, The 32nd Airline Collectible show will be held at the Delta Museum on Saturday, October 6th with over 150 tables of Airline Memorabilia. Admission $12, Kids under 12 Free. The NWA 747-451 is the Queen of the Skies! It was a kick in the early years when NWA would run the 747-451’s from MSP to MCO and PHX during some of the peak winter travel periods -this was before the 747-451’s were fully integrated for long haul Asian operations. If DL’s and NWA’s former Chairman, Richard Anderson were not at the helm, I don’t believe we would be seeing the 747-451 at the Delta Museum today. When in the Twin Cities, be sure to the NWA History Museum in Bloomington. The sun will never set on Northwest Orient Airlines! LOVE this museum and you’ve captured it quite nicely. I’ve been going since before they restored the 1940s hangars–and a magnificent job they did–and will keep going for as long as it’s open! The first time I realized that the Spirit of Delta had yet another museum inside it was such an exciting experience!